A quilting stencil helps you create much more elaborate quilt top designs that you would be able to do on your own, but purchasing stencils from the fabric store can get expensive. Whether you're a machine quilter or you prefer to quilt by hand, you'll find that these free quilting stencils can save you time and money. These free stencils will help you create some beautiful designs on your quilts. 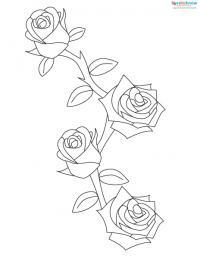 To download the printable stencil simply click on the image of the design you want. After that, save the file to your computer and print it. If you need help using these printables, try these helpful tips. Print this continuous vine stencil. 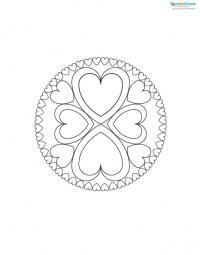 Print this heart medallion stencil. 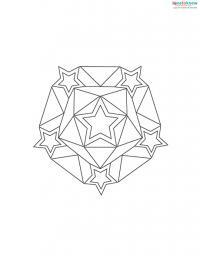 Print this star medallion stencil. One method that many crafters use is pinning the paper design onto the fabric and simply hand stitching over the lines of the stencil. Another great method is to trace your design onto the side of Glad Press and Seal plastic wrap that is not sticky. Then simply stick the plastic wrap onto the fabric and you have transferred the pattern to the quilt for easy sewing. If you own a light box or have a bright window in your work area, you can tape the stencil directly to the glass. Then place your quilt top or quilt square over the stencil and trace the design directly on the fabric using a disappearing ink marker or dressmaker's pencil. If you'll be using the stencil many times, make a permanent version using stencil blanks from the craft store. Simply trace the design and cut it out with a craft knife. Look outside at the beauty of nature. 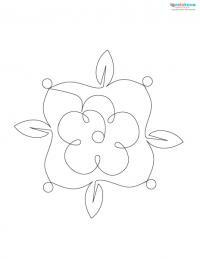 Make your own quilting stencils by tracing delicately shaped leaves or a beautifully shaped sea shell onto plain paper. You can easily turn unusually shaped serving utensils or small free-form candle holders into stencils by tracing them on paper or blank stencil sheets. Trace designs from your favorite magazines or books. Create a stencil by enlarging cursive handwriting from an old letter or manuscript. The continuous nature of the writing lends itself well to this type of project. Stenciling is a beautiful way to embellish and further personalize your quilt. There's no need to pay for expensive quilting stencils when you can make your own using printables or household items. Quilt your favorite design to complete your masterpiece.